or, show me more copyable 𝕗𝕒𝕟𝕔𝕪 𝕥𝕖𝕩𝕥!! need 𝔉𝔞𝔫𝔠𝔶 𝔗𝔢𝔵𝔱 in plain text? check out the fancy text generator! Sometimes we just need a decent stylish text in 10 minutes. We don't have Photoshop, we don't have good design in mind. What if there is a web service for us to browse-and-pick a nice effect, then we just customize → download → use it? And yes, maketext.io is born for this purpose. For every fancy text effect, we provide both SVG and PNG format for you to download. Since SVG is well-prepared for everyone to use in HTML5 era, you will still want to know about its limitation so you can choose which one to use between SVG and PNG more wisely. Just like there are some CSS attributes that are not well-supported by all modern browsers, there might be difference between implementations of browsers to the SVG filter we use, specially of the old browsers like Internet Explorer. Generally speaking modern browsers like latest versions Chrome, Firefox and Safari should be able to render them correctly, but you should check if you need to support browsers like IE9. For a detail list of browser support for SVG filter, check Can I Use "SVG filter" for more information. Rendering SVG can be more CPU-intensive than rendering raster images like PNG or JPG. This is especially true when using complicated SVG filters, and almost all filters here are complicated. Consider using CSS property "will-change" to prevent redundant re-rendering when you use those downloaded SVG files, just like we've done in our stylish text gallery. While SVG is scalable-vector-based and should be responsive-ready, sometimes there are still unwanted aliasing/jagged edges or not-aligned shapes, due to number rounding / precision issues when rendering. If you use those SVG files with dynamic sizing, remember to check it's visual appearence in different resolution before shipping your works. To make custom web font works in SVG files, we actually convert every letter from text into SVG path instead of embedding the whole font file inside it. This can make the file smaller ( if the text is short ), but then it won't be able to change the text after generation of the SVG file, and the SVG file can't be indexed by search engine through its content. You can still use the alt attribute in img tag for SEO though. 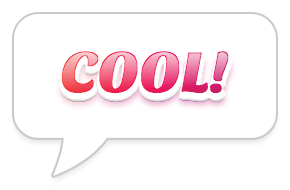 While cool text in images are great, sometimes we need to use them in text posts or even messengers. Check out our Fancy Text Generator, which is dedicated for this purpose: generate stylish text that are copyable! While making stylish text with maketext.io, you may also want to build your own cool text filter. This article "The Art Of SVG Filters And Why It Is Awesome" provides a comprehensive guide with a lot of example for anyone who want to build a cool text SVG filter from scratch, a definitely must-read. Additionally, these filters can actually be used in any shapes, not only for text. For an inspiring example of SVG beyong merely shapes, this talk and slide about "SVGs beyond mere shapes" is the thing you will never want to miss. We want to build this service to its best, but there are always bugs or glitches. Feel free to contact us via contact@maketext.io by mail, or leave your words in the disqus widget below. We always appreciate your feedback and support, by which we could make this service better together. Super fast, vector-based cool text generator powered by modern web technologies.